As the title suggests, I'm in a bit of a pickle. I have installed GParted but I have no idea how to use it. Could someone please explain to me, the layout of my hard drive and what it all means? I have looked at all the other similar questions but I just can't make sense of the answers. I know the best for me is to get a new hard drive but that's not an option at the moment. Could anyone please provide me with a temporary solution using GParted or otherwise? This is not a software or configuration problem. It's a hardware problem, and nothing you can solve repartitioning your hard drive. 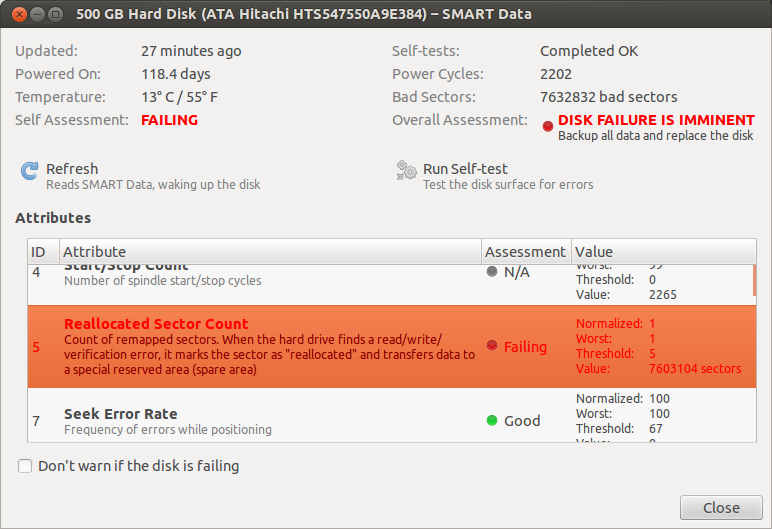 The hard drive failing is /dev/sda, where the Ubuntu installation is in /dev/sda1, while the other partitions /dev/sda5 appear to be an unused partition. This secondary partition is not formatted. About using gparted in the damaged hard drive /dev/sda, I wouldn't recommend it, since it's not going to solve anything and it can make things much worse, accelerating the process. I suggest you use an external unit like an USB or DVD recorder to make a backup of all important information you want to keep because soon your disc is going to stop working completely and you'll have no access to the system at all. By the number of reallocated sectors I can tell you that more than 3712 MB (about 3,6 GB) have been damaged already, so the disc fail is quite serious. If you can't install a new hard drive but you still want to be able to use your PC, I recommend you download an Ubuntu iso and make a bootable USB or DVD so you can boot in live mode. Not a perfect solution but at least you'll have still some use for the computer while you get a new hard drive. Not the answer you're looking for? Browse other questions tagged installation partitioning hard-drive gparted smart or ask your own question. How to turn off hard drive when booting from USB? Reallocated Sector Count - is drive failure really imminent?